Our visual division here at Steve Spangler Labs loves the science of color mixing. We've mixed gels, fizzing tablets, and even different colored lenses together to get the secondary colors. We needed something new. So, we found an amazing way to combine scientific principles of physics with the visual science of color mixing. Our discovery isn't just visually spectacular, it's scientifically sound! Trace a circle onto a piece of white corrugated cardboard. Try to get the circle to be between 4 to 6 inches in diameter. Use something like a cream cheese lid, sour cream lid, or pickle jar. Cut the traced circle out using the scissors. Trace 3 smaller circles on the cardboard disc. Try to make each of the circles equal in width. This will enhance the visual aspect of the experiment. Draw a single line through the middle of the disc that spans the entire diameter of the disc. Each of the three circles in the disc should now be divided in half. Color half of the smallest circle blue and the other half yellow. Color the middle circle half red and half yellow. Finally, color the largest circle half blue and half red. 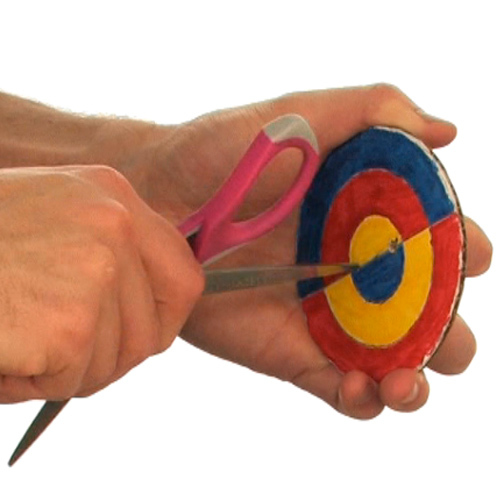 Grab an adult for this step: Using the pointed tip of the scissors, place two holes in the cardboard disc. Make sure the holes are an equal distance from the center of the disc and are about 1 inch apart. Use the scissors to cut a piece of string or yarn that is 4 feet long. Thread the string or yarn through each of the holes in the disc and tie the ends of the string together. Make sure the knot you tie is reliable and able to withstand a substantial amount of force. You are going to be tugging pretty hard on it. 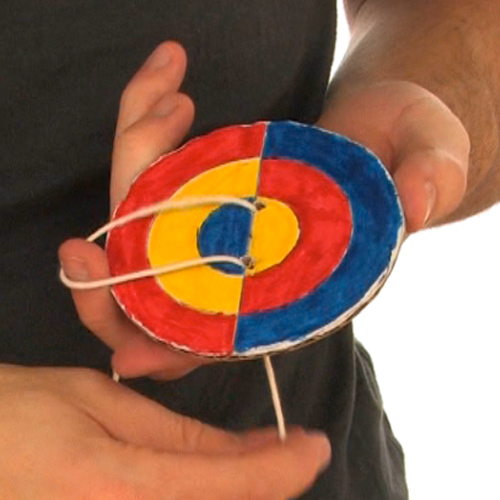 Start by holding the string on both sides of the disc with your hands. Make sure the disc is as close to the center of the string as possible. Spin the disc in a motion similar to a jump rope. This is a quick way to get the string wound up. Once the string on both sides of the disc is twisted, pull the string tight to get the Color Mixing Wheel spinning. It might take a little practice to get it just right. Once you have the hang of how the Color Mixing Wheel works, you'll be able to keep it going as long as you want. You may have noticed that the colors you put on the Color Mixing Wheel were the three primary colors: red, blue, and yellow. 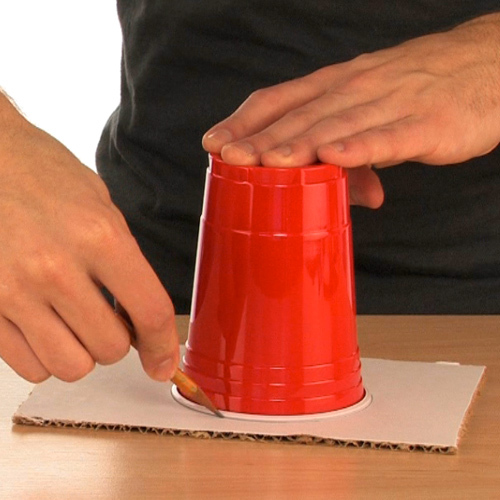 Once you started spinning the wheel, what did you notice about each of the three color circles on the cardboard disc? What do you think makes this happen? Let's start with the visual part of the experiment - color mixing. The colors you put on the Color Mixing Wheel are the three primary colors: red, blue, and yellow. When you combine two primary colors you get the secondary colors: green, purple, and orange. Obviously, the individual colors on the wheel are not mixing. The color mixing that happens is due to the speed at which the wheel is spinning as the string twists it. The colors are spinning at such a rate that your brain is unable to process them as the individual colors that are on the wheel. Instead, your brain takes a shortcut and creates the secondary colors. Now, why does the string continue to twist? The answer lies in physics and, in particular, momentum. Once you have the string twisted, pulling on each end causes it to go tight. When the string is pulled tight, it wants to be completely straight. In going straight, the string unwinds from itself and causes the disc to spin one direction. But the string doesn't stop once it's unwound. It speeds past and gets twisted again. 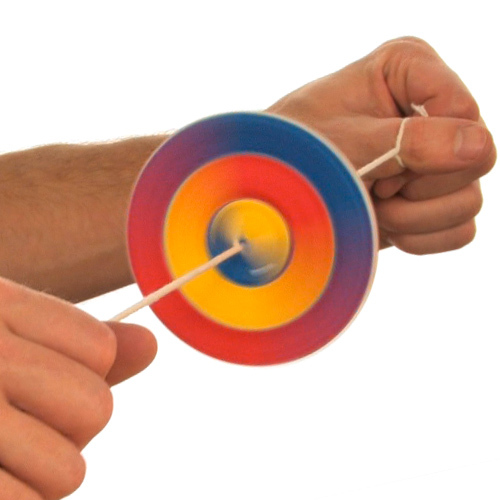 The momentum from pulling the string tight keeps the disc spinning until all the momentum is gone. Then you pull the strings tight again and set the disc spinning in another direction.